Welcome to the SkyServer tools pages! 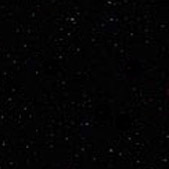 SkyServer's tools allow you to access all publicly available data from the Sloan Digital Sky Survey, one of the largest surveys of the night sky ever made. You can use SDSS data to learn about the way the universe works, or even to do original scientific research! The Getting Started pages will tell you what types of data are available on SkyServer, and which tools are best for accessing which types of data. These tools give you many different ways of looking at our data. Some tools also have help pages that will give you more specific information on how to use the tool. Graphs of the amount of light emitted by an object at different wavelengths. Spectra can be used to study the compositions and temperatures of objects, as well as their distances from Earth. Various quantities measured from an object's spectrum, such as its spectral type or redshift. To learn about the other types of data available on SkyServer, read through the Schema Browser. The table below gives a short description of each of SkyServer's tools, listed from the most simple and general to the most complex and specialized. The table also shows when you might use each tool, based on what information you know already and what information you want to find out. Click on the name of a tool for more information on what it does and how to use it. Famous Places Presents a gallery of beautiful images from the SDSS, with links to information on each object. you want to see a few beautiful images SDSS has taken. 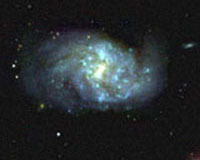 Lets you enjoy the sight of the sky as the SDSS telescope sees it when scanning along its nightly cycle. you want to see how the sky looks to the SDSS telescope. Lets you download images (organized by SDSS run-camcol-field) and spectra (organized by spectrum and SDSS plate). you know the SDSS run-camcol-field number of an image, or the plate-spectrum number of a spectrum, and you want to look at or download the image or spectrum. when you want to use SDSS images to help you find an object with your telescope, or when you want a printout of an SDSS object. Lets you navigate through the sky by panning and zooming. 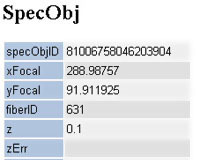 When you click on an object, you get a summary of its photometric data. You can also save objects in a notebook and export them to a spreadsheet program for later analysis. you are looking through the sky for objects to study. Lets you look up all photometric and spectroscopic data for individual objects. 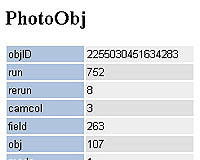 you know an object's ID or position and you want to look up its data. Lets you search the database for objects near a certain sky position (in radial or rectangular coordinates) or with certain brightnesses. you want to find objects in one part of the sky. Lets you select search requirements from menus to build up a simple search of the sky. you want to find many objects that meet simple criteria that you devise. Lets you search the database for all objects that meet any criteria you can think of, then returns whatever photometric or spectroscopic data you request. The SQL search tool is the most powerful tool on SkyServer; professional astronomers use a very similar tool in their research. you want to answer a specific astronomical research question quickly. Displays thumbnail images for a list of objects (name,ra,dec), or for the results of a SQL search. you want to quickly scan through a list of objects, or through the results of your search. Lets you upload a list of sky positions, then returns a list of all SDSS objects near those positions. you have a list of sky objects from another astronomical database, and you want to find all SDSS objects near each of your objects. Help gives you information that will help you understand how to use SkyServer. The Help section includes a glossary and a description of SDSS's data reduction algorithms. How To Graph tells you how to graph and analyze data using Microsoft Excel. The Schema Browser explains how the SkyServer database is organized. Using the Schema Browser is absolutely essential to using the SQL Search tool.